Nick Geiman, York Catholic, sr.: After four years as a mainstay on the Irish card, Geiman closed out his high school career with his best season yet. Finishing the season with a league-low 72.5 average, Geiman was the model of consistency, which was one of his main areas of focus in the offseason. He shot a 71 at the YAIAA tournament to win the league title and tied for second at the District 3 Class AA tournament. "I really worked a lot in the offseason to hit a fade," Geiman said. "I used to always hit a draw and really wanted to get rid of the big miss for me, which is a hook to the right." Avoiding the big miss was exactly what Geiman did. His season consisted of rounds between 69 and 77, always avoiding the blow-up hole. Geiman carried that consistency to the second day of the PIAA tournament, when he teed of as part of the lead group. He finished Day 2 with a 73, the second-best second-round total in Class AA, good enough for a third-place finish. "States were great," he said. "I had been thinking about winning it since August. My main goal was to give myself a chance to win. Through five holes on the second day, I was leading. It got to me right away. It was such a great experience to be there." In addition to his individual success, he helped lead the Irish to a third-place finish at the PIAA Class AA team tournament, plus the District 3 team title. "It was great to have a team that was very competitive," he said. "We could have had a different lineup every win. Joe (Parrini) came in and had a great year and played great. Everyone really contributed, which made it special." Geiman has not chosen where he will attend college, but he plans to play golf and major in business administration or marketing. Victoria Ross, Spring Grove, sr.: In her first three years, Ross dominated the local golf scene, and 2014 was no different as the senior led the Rockets in scoring with an average of 76.7. She beat that average in the YAIAA championships, shooting a 73 for her third straight league title. Her District 3 run rewrote the history books. Tied with future Limestone College teammate Allison Copper from Central Dauphin through 18 holes, the two endured a playoff that set a District 3 record with five playoff holes before Copper ended up edging Ross. "That was incredible," Ross said. "To be able to share it with my future teammate is something we will forever cherish." Ross lowered her scoring average by six strokes this season and attributed the improvement to a new — or maybe an old — putter. "I golf a lot with my grandpa, and we were practicing putting, and I was trying some of his putters. I came across one that was 20 years old and it felt great. I used it this year, and it helped me tremendously." Ross and head coach Dave Childress also pointed to the senior's strengthened mental aspect of her game. "I prepared myself more mentally than I did before," she said. "All the other years I had the athletic ability, it was just I didn't really believe in myself like I should have. I found once I started to believe in myself I could do really well." "She can have a bad hole and still have a smile on her face," Childress added. "In her junior year, she would have carried the anger to the next hole. It was huge for her success this year." Ross will attend Limestone College in South Carolina next year but is undecided about her major. She is leaning toward business administration or architecture. Kevin Crumbling, Eastern York, jr.: The junior finished the year with a 74.8 average to lead the Golden Knights to the YAIAA Division II title. Crumbling made it to the second day of districts before seeing his season come to an end. Axel Hartman, West York, sr.: The senior was a model of consistency for the Bulldogs, who finished second in the YAIAA Division II standings behind Eastern York. Hartman finished the season with a 75.0 average and qualified for regionals for the second straight year. Gus Minkin, Central York, jr.: Minkin finished the season with a 74.3 average and led Central York to the YAIAA Division I title. He shot a season-low 68 at the Outdoor Country Club early in the season. A two-day total of 151 was good enough for Minkin to finish tied for eighth at the PIAA Class AAA championships, just six strokes behind the winner. Joe Parrini, York Catholic, fr. 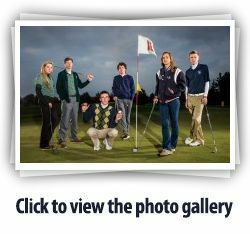 : The freshman hit the state golf scene by storm, winning the District 3 Class AA title and finishing in a sixth-place tie at the state tournament. He helped lead York Catholic to a perfect regular season, a league title and a District 3 Class AA crown, and he helped the Irish to a third-place finish at in the PIAA Class AA team tournament. He shot a season average of 73.0. Lauren Parrini, York Catholic, sr.: The Irish senior went on an incredible postseason run that saw her finish second at the YAIAA championships and a dominant 13-stroke victory at the District 3 Class AA tournament. She and her brother Joe won their district titles on the same day. She finished second at the East regional and she qualified for the state tournament, where she finished 15th. She finished the season with a 85.0 average. Dave Childress, Spring Grove: The Spring Grove head coach put the Rockets on the map. For the second straight year, six Spring Grove golfers qualified for the District 3 tournament, with Ross leading the way. The Rockets finished third in a difficult YAIAA Division I but lost four matches by six strokes each. Three of the Rockets' top golfers are sophomores (Luke Huffnagle, Mason Staub and Eli Brooks), and a fourth (Garrett Leib) is a junior, so the future is bright. "These guys improved so much from last season," Childress said. "They deserve all of the credit. Eli improved by three strokes, Mason by seven strokes and Tori (Ross) improved by six strokes." Childress credited the Rockets' offseason trip to Florida with bringing the team together as a unit and getting the golfers to believe in themselves and their abilities. Central York: Connor Bacha, Julianne Lee. Dallastown: Blake Sebring. Eastern York: Andrew Davis, Zach Dixon. Red Lion: Dylan Reichard. Susquehannock: Caleb Bryant.